Several weeks ago, we announced a new Delimiter Auto-Complete feature coming to the 2013.2 version of SyntaxEditor for WPF and Silverlight. This feature is great because it improves typing efficiency by auto-inserting end delimiters when the start delimiter is typed. We have been wanting to improve the typing experience even more and in today's post, I'd like to announce that curly brace auto-indent is also coming. What Is Curly Brace Auto-Indent? When the caret is in the middle of a curly brace pair, pressing Enter normally will move the close curly brace to the next line with the caret right in front of it. If you have an indent provider for your language, the close curly brace will be indented properly however it's still not an ideal situation because you generally want the caret to be on its own line before the close curly brace's line. This scenario is where curly brace auto-indent comes in! This feature injects a new blank line in between the braces, indents one more level, and positions the caret on that line. The end user is immediately able to start typing content for the function. They can easily be added to any custom language as well with a few lines of code. A couple weeks ago, we made a major update to our Office 2010 style icons that brought the bundle to over 80,000 total images. Once bit of feedback we've gotten from customers is that they'd like to see a similar bundle that is designed in the more modern flat appearance used in Office 2013. Today we are pleased to announce that we've delivered on this and have released a brand new icons bundle named Icons Metro Essentials that contains over 108,000 total icons! By the way, these icons look great with the Metro themes found in our WPF Controls. 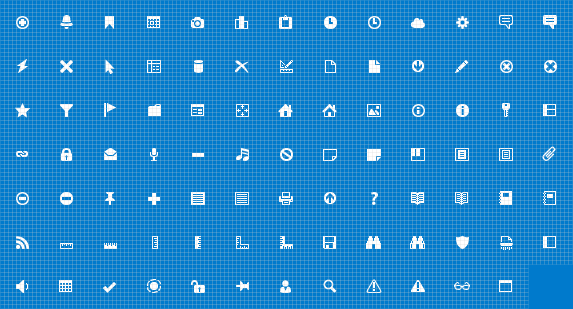 Icons Metro Essentials includes over 3,600 completely unique icon designs. Each icon design is implemented in multiple sizes (64x64, 48x48, 32x32, 24x24, and 16x16), multiple states (normal, hot, and disabled), and are delivered in alpha-blended PNG and Icon file types. 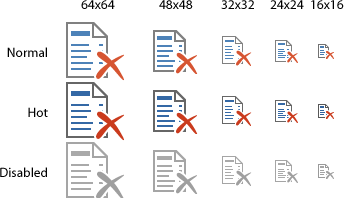 The above example shows the multiple sizes/states for a single icon design. Notice the pixel-perfect quality of each icon. These aren't just large icons that were scaled down to various sizes. Each icon has been individually cleaned up to have clear, crisp lines. See the full preview on our web site to see all of the included thousands of icon designs. Are you looking to update your app or web site's appearance to the latest Office 2013 appearance? Get Icons Metro Essentials today and you'll be well on your way. Last week we announced that Actipro Icons Essentials v3.0 was released. Icons Essentials is our main icons bundle, with thousands of unique crisp and clear icon designs. We also offer an Icons Elements package that consists of various adornments that are intended to be combined with other icons (such as those from Icons Essentials) to create icons with new meanings. In the example above, an "image" icon was combined with a "hand" element to create a "share image" icon. Today I'd like to announce that version 2.0 of our Actipro Icons Elements product also launched last week, adding new image designs and new image size variations (64x64, 48x48, 32x32, 24x24, and 16x16) into the mix. The first version of these icons only included two size variations. All icons ship in PNG and Icon formats. Note that elements are smaller than normal icons since they are intended to be merged into other existing icons and just change their context. They afford you the ability to mix and match however you need. WPF Controls 2013.1 build 582 has been released and is now available for download. This build focuses on minor enhancements and bug fixes. Silverlight Controls 2013.1 build 152 has been released and is now available for download. This build focuses on minor enhancements and bug fixes.